It’s budget season again. I talked about this briefly in this post. Budget season typically starts in September when we (OMB) receive budget submissions from agencies. And it ends in February with the release of the President’s Budget. Last year the timeline was different because the Administration changed in January, so budget season shifted to the spring. Anyway, all of budget season is crazy, but October and January are the craziest. So that’s happening. I’ve been working more than usual. We’re buying a new house! New to us and new new. It’s a few miles away from our current house (which we rent and where we’ve lived for almost five years). It’s new construction and will likely be complete in March or April. I’m expecting we’ll move in April. It’s been a lot of fun to pick stuff out (first floor floorplan, cabinets, tile, hardwood, carpet, countertops, sinks, etc. ), but it’s also taken up a lot of time. And there have been a lot of meetings, both during work and outside of work hours. Plus all the general house-buying and mortgage paperwork. I’m pregnant! 16.5 weeks. It’s going great, but I was more exhausted than I could ever imagine feeling in the first trimester, so sleeping cut into my free time more than even normal. My 9pm bedtime became 7:30 sometimes. With two naps every Saturday and Sunday. It was the worst weeks 5-10 (so, late September through the beginning of November). Plus, there’s been prenatal appointments and ultrasounds and lots and lots of reading, so it’s been keeping me busy. Needless to say, I’ve been a little lazy in the kitchen. I went through a period of relying heavily on Sweetgreen and Taylor Gourmet salads for lunch, but I’ve mostly resolved that. Then I started picking up the pumpkin spice yogurt pots from Pret in the mornings as I made my way from the Metro to my office in DC. I’ve also been voting for pizza delivery somewhat frequently – not quite once a week, but not too far from that either. Often on Sunday nights when we’ve had a busy weekend or been out of town. My diet in general in my first trimester kind of went downhill. Not terribly. I still ate mostly really well. But I was definitely more lenient with the Halloween candy that was around the office and the frequent pastries people brought in. I also was testing out my recently-resurrected sourdough starter and making/eating much more bread than normal. I got it together for several weeks before Thanksgiving though, and since Thanksgiving it’s been so so. Better than before, but not awesome. Starting to sort of slide downhill again. This week has been a week of holiday parties and socializing (and treats – so many treats!). I’m thinking of doing a Whole30 again in January, as I’ve done the last two years, but maybe including grass-fed (usually Greek) yogurt which I just can’t get enough of. We’ll see. Ready Player One by Ernest Cline. This was for bookclub (I hosted this month!). I really enjoyed it, but it took me a long time to read. Manhattan Beach by Jennifer Egan. This was our last book club book – my recommendation. I loved A Visit from the Goon Squad, and Jennifer Egan happens to be Dan’s best friend’s cousin, so we’ve anticipating this one for a while. LOVED it. Exercising Through Your Pregnancy by James Clapp and Catherine Cram. Made me feel better (and optimistic) about continuing to CrossFit through pregnancy. Pregnancy, Childbirth, and the Newborn by Penny Simkin and others. It took me a while to get into this because it launches pretty quickly into making decisions about birth itself, and I was still in a what-should-I-expect and whats-okay during pregnancy stage. But I’ve started to transition, and now find this really useful. It has a clear but fairly subtle bias toward unmedicated childbirth (which I am interested in), but I feel it presents other options objectively and fairly without speaking negatively/judgmentally about them. Mostly, it just explains the processes of labor and giving birth and post-birth in detail, which is really helpful. Because I’ve never done it before! The Thinking Woman’s Guide to a Better Birth by Henci Goer. I’m not really into this one yet. It’s much more biased about preferring midwifery (which I’m using) and unmedicated childbirth (which I’m interested in), but at this point, I’d prefer the information being presented to me without judgement and with facts about all options. I can’t even remember where I got the recommendation for this. We’ll see if I get through it. Fine, I admit it. I’ve been watching the entire series of Gilmore Girls. Again. Really, for like the millionth time (more honestly probably the tenth or so). I start it every Fall and watch the whole series. I don’t actually watch most of it, it’s just on in the background as I cook, fold laundry, etc. Stranger Things Season 2. Dan and I are trying to watch this together. I think we’ve made it to episode… 4? Maybe 5? CrossFit 3x/week. So far so good. I maybe missed one or two workouts during the first trimester to prioritize sleeping, but as usual, my energy is highest in the morning and it’s later in the day that I start to flag. So workouts were mostly fine. My gym offers three sets of suggested weights/programming for each WOD – ‘fitness,’ Rx, and Open. I worked up to being very comfortable with the fitness weights through my first year of CrossFit, and before becoming pregnant had started to work towards Rx. But since becoming pregnant, I’ve mostly stuck to fitness. I was still doing strength maxes, though. Starting around week 10 or 11, I started to scale back on those as well (opting to do more like 70% of my 1 or 2RM), and also to pay closer attention to whether I would be able to converse during WODs. Now that I’m in the second trimester, I’ve decided to stop kipping pull-ups and any sit up things and will instead do things like strict pull-ups, ring rows, and planks. Baltimore Running Festival Half Marathon. This was when I was about 9 weeks pregnant. My pace was 8:50 (total time: 1:55:51), which is slower than my half marathons from the past 3 or so years, but still respectable. Training runs were tough leading up to it due to how tired I was. I’m also just less into running lately, and don’t think I’ll keep doing half marathons twice a year. But, got ‘er done and was pleased with it. The weather was amazing (high 60s, low 70s, sunny – actually felt hot at points). Thanksgiving Turkey Trot 5K in Grand Rapids, MI. My sister, her boyfriend, Dan, and I all ran this. This was my 6th or 7th year doing a 5K on Thanksgiving Day. Pace: 8:34, Time: 26:35. Upcoming – I’ll be running the Celtic Solstice 5-mile run in Druid Hill Park this Saturday. It’ll be my third year in a row. A friend couple came up from Houston for a weekend in early November. We went camping in Catoctin Mountain Park at Owens Creek Campground. 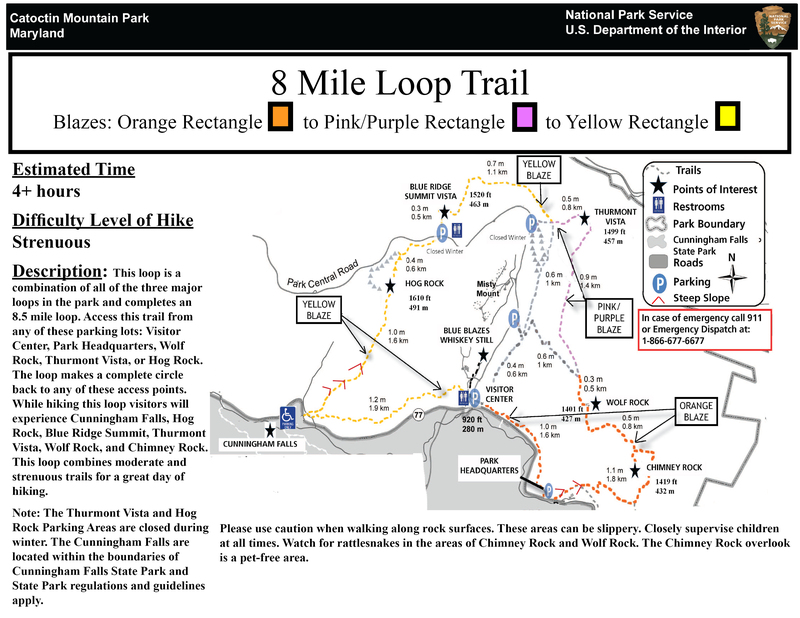 Before heading to the campsite, we did the 8-Mile Loop Trail. Dan and I had done this once before with his mom (or maybe just a part of it.) The leaves were beautiful, and there were a couple of nice overlooks. The weather was slightly on the chilly side, but it was really nice to hike in. As we drove from the end of the hike to the campground, it started raining. And it continued to pour through the next morning. We attempted a fire for a while, but finally gave in and gathered together in one tent to eat trail mix and play cards. The following weekend, which was quite cold, Dan and I did a 6-mile hike in Gunpowder Falls State Park Hereford Area. Clockwise, we did the Gunpowder South to Sandy Lane to Panther Trail. The Modern Mamas Podcast. Trying to binge-listen to get up to current, but they keep just putting more out! I’m only up to number… 13 I think. I’ve most enjoyed hearing about Laura’s birth story and being introduced to Aware Parenting concepts. Occasional Girls Gone WOD podcasts, but I’ve definitely fallen behind. I underestimated the first few. My experience of hiking in Japan now is that it is almost invariably steep and usually involves a lot of stairs or rock scrambling. It was like doing hours of stair stepper. But prettier. Japan is a small country with a lot of people. The hikes are not very remote and are generally fairly developed/built. And crowded. MontBell seems to be the hiking gear brand of choice for Japanese, though I’m not sure if that’s because they offer rental equipment. Speaking of, it seemed like many people hiking Fuji rented their equipment – from packs to shoes. A good option if you don’t want to carry a pair of hiking shoes and warm clothes all over Japan in the middle of summer for the rest of your trip. While some people were outfitted head to toe in serious hiking gear on each of these hikes… there were also pretty ladies in kimonos and sandals on at least one of them. And everything in between. Japan’s got some pretty cool stuff to see on hikes. We hiked up Mt. Fuji from the Subaru Fifth Station on the Yoshida Trail. There are four main trails up Mt. Fuji. Yoshida is the most popular. You can begin Yoshida, and I believe the others, further down the mountain. I think most people begin at this or another fifth station, and the Subaru Fifth Station is where most of the tour busses and other public transportation go. I wrote about getting to the Subaru Fifth Station in my main Japan post. We each packed a day pack (Dan used the top of his Osprey backpack and I used this awesome Sea to Summit sack) and then stuffed our packs (i.e., our luggage) in a somewhat random-seeming pay locker (1000 yen) in one of the buildings. Then we paid 1,000 yen donation to the folks asking for a donation and set off. It started okay. The trail was relatively flat (even downhill – which ended up seeming unfortunate the following day when we hiked back) and wide for a while. There were a lot of people, but there was a lot of space. Before long, though, we started switchbacks up the mountain along a trail that soon had ropes on either side. It turned out that this would be what the rest of the trail was like. I estimated it would take us 4-5 hours (max 6) to get to the hut where we would sleep that night. It took us 2.5. We were definitely moving, and more quickly than most people, but it was manageable. We were also willing to be jerks a little bit. Not too long after we started switchbacking, a few things happened to cause some backlogs: the trail narrowed a bit, the trail became very rocky and required some scrambling, and we began passing huts along the trail. At the first backlog, leaving a hut area, I was a bit flummoxed. I was sure it was an anomaly. But no, they got worse. Luckily, Dan and I were able to rock scramble around the crowds (still within the ropes of the trail, but to the sides where no one else was scrambling). We made it to the hut around 4ish, were asked to eat dinner right away, and enjoyed a beer at 3,400 meters looking down at the hikers continuing their way up the trail. This particular hut holds 300 people and was sold out, I believe. After a bit of a fiasco with our sleeping area (one sleeping setup was missing), Dan and I went to bed at 7pm and got a little bit of sleep. At 2am, we got up with the rest of the hikers that intended to make it to the summit by dawn. Using the previous day as my guide, I assumed it would take us less time to get to the summit than I’d originally estimated (1-2 hours), and I was worried about getting to the summit too early and being cold. I was already cold. So we set out around 2:30/2:40, and DAMN, we should have left earlier. We almost missed sunrise. The trail up the mountain was SO crowded that we were literally in a traffic jam the whole way up. Sunrise was at 4:40, and we literally got there at 4:35 and raced to a spot where we could see. It was infuriating. The trail was narrower, so we couldn’t be jerks and go around anymore (though we did a bit early on – then we started getting chastised). Sometimes it narrowed to single-file from two, causing further backups. It was like step forward. Wait two minutes. Step forward. Wait two minutes. The sky started lightening around 3:15 or 3:30. It was pretty. But. Thank goodness we made it for sunrise. It was really beautiful. I’m pretty sure that makes the whole experience worth it. And our hike around the rim of Mt Fuji was also really nice. We got to walk through a snow field and see the shadow of Mt. Fuji projected on the valley below it. Then we were ready to go down. It was about 6am. We were among a crowd of hundreds of people trying to enter the trail (while some others were still coming UP the trail). By 7am, we had gone two switchbacks (maybe 100 yards). It was like that until we got back almost to our hut where the trail finally split off and there was a separate down trail that was even less pretty than the up trail, but was at least wide. Still steep, though, and mostly gravelly. This hike started from the top of the Shin-Hotaka Ropeway. I’d read in our Lonely Planet guidebook that you could hike this either direction, but that Kamikochi to the Shin Hotaka was very steep. We’d just hiked Mt. Fuji and just the timing and bus schedules made this direction more manageable. There was no information in the main Shin Hotaka observation deck building about hiking, nor were there clear signs upon exiting the building onto trails. We saw a couple going one direction, which seemed to be the only direction to go, and tried to ask if it was the way to Kamikochi. They told us that no, hiking to Kamikochi was ‘very hard mountain’ and that they thought it was ‘impossible from here.’ It was hard to know whether they actually meant impossible (like, that was the wrong direction), or it was just known to be a difficult hike. So we returned to the building to ask and got a sorta map written on the back of a receipt by the store clerk. We determined that had been the right trail and set out. But all the signs were in Japanese until we got to a mountain hut. So, the Japan Alps do have a good network of huts that allow for multi-day hiking trips. We were strongly advised to fill out a form in a small cabin before setting out regarding our intended itinerary or face a 50,000 yen fine, which we did. But we were only going for the day, of course. The trail was pretty steep uphill until we got to the only hut on our route, where we stopped to eat snacks. Then we continued on, and the rest of the trail was pretty steep downhill (many of it actual steps) into the Kamikochi valley. I think it took us about 3 hours total? This was the least developed of the hikes that we did, but it was still fairly developed. We passed a few people along the trail, but not many, so it was also the least crowded. We were trailing a trio of American guys that we then later saw in the Peace Memorial Museum in Hiroshima – see, small country. Kamikochi was beautiful. It’s not really a town (at least what we could see). There’s a bridge on the south end, where we arrived, and then another bridge about half a mile north on the north end that crosses the river. On the side of the river we arrived on, that half mile is dotted with several ryokans (one of which had a public onsen that closed at 3pm and we arrived at 2:45, sadly, so we didn’t go). We walked to the north end and crossed over. That side had a couple restaurants/stores and the bus terminal. I think that’s all there is. Picture of the map that I took at the top of Shin Hotaka. It showed the route from the Ropeway to the hut then down to Kamikochi. More directional signs. In Japanese. Directional sign, finally with some English, at the hut. We passed through this at the end. River and mountains in Kamikochi valley. I believe ike means pond. This hike is from the top of the Happo One ski resort chair lifts (a gondola and two chair lifts) to a pond. The trail continues further to the summit (dake) of Mt. Karamatsudake, but we didn’t have the energy or time for that – we wanted to get back to our Hakuba ryokan and relax! Also, the clouds were rolling in and we didn’t want to get caught in a storm. I was less worried about hiking in the rain and more worried that the lifts would stop operating in a thunderstorm and we wouldn’t be able to get back down in a timely fashion. Again, this trail was super rocky and pretty steep. Partly, this was the route we took up. On the way down, we took a slightly different route that had more built boardwalks and steps that made it easier. The views of Hakuba and the valley and the surrounding mountains were beautiful. And we saw (and walked through!) snow fields! For the top half of the hike we were primarily in clouds, including at the pond, which made it look very misty and dreamy. I think we got to the top of the lifts around 1 and were back to the lifts by… 2:30? So this wasn’t a super-long hike. But it was really pretty. And made us sorta feel like we earned our onsen :-). I don’t have a lot to say about this one. Read this for more information, better pictures, and a generally more positive perspective. (Note: we did this in the opposite direction of that description, as we wanted to eat above the river before starting.) As I mentioned in a previous post, the heat and humidity while we were in Kyoto killed my soul a little bit, and getting out of the city in the mountains a little bit didn’t help. At all. Plus, it was a Saturday, and this is a common excursion from Kyoto for tourists and Kyoto residents alike. It wasn’t crowded like Mt. Fuji by any means, but it wasn’t remote at all and we were hiking with many other people. This is the hike that many women in kimonos were hiking! With slow, short steps, as their strides were limited by their outfits. They looked wonderful with their perfect makeup and nicely done hair, while I was sweating like crazy and a little grumpy. It’s almost not even right to call this a hike. It was more like a stair climb to a summit and then a stair climb down, via a temple. We only took one picture. However. On a day that is not 95+ degrees F with 95% humidity, I can see where this would be a really lovely outing, with or without the crowds. This is one of several popular hikes on Yakushima. The other we strongly considered was a full-day hike to Jomon Sugi, the oldest and largest cedar on the island, estimated to be 3,000-7,000 years old (!!). However, this was the last full day of our trip, and we were staying in a fancy hotel, and we wanted some time to relax, unwind, and enjoy ourselves. So we opted for Shiratani Unsuikyo, which offers three different loops of varying lengths. We essentially did all three, except for portion of the shortest one that didn’t overlap with the other two. I estimate that it was about five miles total?? To get there, you drive up a very windy, often one-lane road with very beautiful views of the valley and the town of Miyanoura on the coast below. We passed a family of monkeys on the side of the road! (We’d also seen monkeys in Kamikochi walking along the bank of the river.) The parking lot was full when we got there, but there they let us park on the side because we had an itty-bitty rental car. Others had to park further down the mountain road and walk up. It cost 500 yen (or maybe 300?) per person to enter. The path started with boardwalk and steps, but once we veered off onto the longer loops, we found ourselves in what felt like very deep, very misty forest. We passed several very old cedars, all of which had signs marking them and observation platforms (usually with a bench) for sitting and admiring. There are also several large ‘second generation’ cedars in which a seed germinates in the stump of an older cedar. In a few places, there were signs describing how the forest has been cleared and replanted to some extent, and that all of the cedars in a particular area are from a ‘mother cedar’ in the area. It poured on us at one point and was generally just wet and misty, so a lot of my photos have the film of mist over them. Apologies. We were able to hike to a rock summit with a really nice view of the valley. It was cloudy so pictures don’t do it justice, but it was a nice panoramic view. We had planned to eat lunch up there, but no food was allowed (understandable since it’s a popular hike and it would probably get too crowded having people hang out up there too long), so we ended up having to eat our hotel-boxed lunches (rice, fish, and orange slices) off the side of the trail soon after. So that’s my experience of hiking in Japan. I would love to do more, especially multi-day hikes, in the Alps. We saw such cool stuff everywhere though, despite my grumbling about crowds and heat. Super awesome experience!